provide an alternative upstream migration route for sockeye" and "a selective water withdrawal capability at Brownlee Dam." Water temperatures in fishways and forebays of dams in the Federal Columbia River Power System have routinely exceeded 68 degrees for extended periods of time, according to the Fish Passage Center (FPC). Although this allegedly chronic problem has been acknowledged, it has gone "largely unaddressed," the center said in its review of an April 2016 draft report on last year's disastrous adult sockeye run through the Columbia and Snake river system. The April 2016 document, "2015 Adult Sockeye Salmon Passage Report," has not been publicly distributed and is still in draft form for co-manager review. However, the Fish Passage Center has posted its May 4 comments on the report on its website. The 2015 sockeye passage report was drafted in April 2016, prior to the U.S. District Court 's May 4 rejection of the 2014 BiOp. The passage report -- prepared by NOAA Fisheries in collaboration with the U.S. Army Corps of Engineers and Idaho Department of Fish and Game -- does not discuss the historical extent of high temperatures in the fishway. According to the FPC, a 1998 BiOp and Record of Decision called for investigating fish-ladder temperatures and evaluating engineering solutions. Eighteen years later, the passage center said, "NOAA is still recommending that the Army Corps 'improve monitoring and reporting of all mainstem fish ladder temperatures and identify ladders with substantial temperature differentials'" that exceeded 1 degree C.
The FPC goes on to say the draft report should not emphasize monitoring but focus on "evaluating the existing information and making immediate modifications to fishways to address the ladder temperatures." "Research shows that the problem in ladders seems to occur not necessarily at 68 degrees," Ritchie Graves, chief of NOAA's Columbia River hydropower branch, told NW Fishletter, "but mainly when there's a differential greater than 2 degrees [F] at the top and bottom of the ladder." Adult salmon can perceive differences in temperature as a passage barrier, the report says. Graves cited this issue as one of the main reasons the sockeye report calls for these three actions: 1) finding out where ladder differentials occur; 2) learning if there are means of addressing the differentials; and 3) implementing structural or operational modifications that are likely to be effective. In response, FPC Manager Michele DeHart directed NW Fishletter to the center's May 4 comments, which said NOAA's discussion of water temperatures in the FCRPS obscured the point that 68 degrees is exceeded in fishways throughout the Columbia Basin. 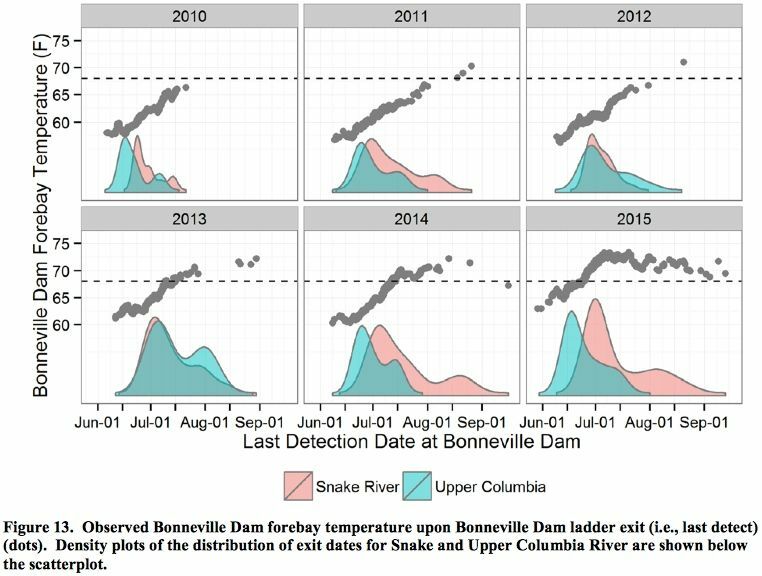 In its comments on the draft report, the FPC used data from 1998-2015 on daily-average temperatures in the forebays of Bonneville and Ice Harbor dams to demonstrate the extent of the temperature problem. The year with the highest proportion of days with temperatures over 68 degrees -- 50 percent of the days between May 1 and Sept. 30 -- was 2015. "Even the years with the lowest proportion of days with temperatures exceeding the 68 degrees limit still exceeded the limit 20 percent of the time," the passage center's review said. Salmon survival is jeopardized at temperatures of 68 degrees and above. NOAA's draft report argued that prior to the construction of dams, water temperatures in the Snake River often exceeded 68 degrees during July and August. The Fish Passage Center said that the report's data are from a 1963 document and are six-day averages of maximum-daily temperatures, which "may represent a one-hour or few hours' peak temperature exceedance." They are not comparable to the recent data of daily average temperatures, the FPC said. The passage center said the 2015 report also failed to mention that in a natural river, salmon find cool-water refuges to wait out daily-peak temperatures and do not experience extended periods of exposure to high water temperatures. During the 2015 adult sockeye migration, temperature data were not readily available to fish managers. Since then, the passage center has been working with the Corps to obtain these data and make them accessible on its website, the FPC said. "The region is pulling together and so far, we are seeing a lot of collaboration on this issue," NOAA Fisheries spokesman Michael Milstein said. Milstein said that "temperature monitoring and reporting in the ladders is improved, and the Corps new temperature-control device at Lower Granite seems to be working even better than expected." He said that the temperature gauge was tested earlier this month. The Corps is making other improvements, he said. While most of the FPC review was devoted to the recurring temperature problem in fishways, it also faulted the NOAA draft report for not addressing the record-low survival of summer Chinook coinciding with last year's high water temperatures. Although the passage center agreed with NOAA that sockeye transported as juveniles had poor survival through the hydro system, the FPC review took the issue a step further: "Historical data and the 2015 experience indicate that sockeye salmon should not be transported as juveniles." Also not considered in the report, the FPC said, were two previously discussed suggestions: "continuous cycling of the navigation locks to provide an alternative upstream migration route for sockeye" and "a selective water withdrawal capability at Brownlee Dam." NOAA, along with the Corps and IDFG, will finalize the report once this year's returning salmon are mostly out of danger. "Right now we are focusing on tracking the current migration and managing the system more effectively for adult sockeye based on the lessons we learned last year, as articulated in the report," Milstein said. "Completing the report is a lower priority than protecting the fish." He also noted that the 2016 migratory and passage conditions look hopeful, at least at this time. "The cool weather has also been helpful -- river temperatures have cooled somewhat. Dworshak reservoir is near full pool. Survival rates seem good so far and more than 40,000 sockeye have already passed Bonneville Dam. We are ready to act if needed," Milstein said.